The Spine & Orthopedic Pain Center provides Non-Surgical Solutions for your spinal and joint pain. It is a one-stop shop with Physical Therapy, a Fluoroscopy Suite, and a Pain Management Physician under one roof. Do you have spinal or joint pain? Together We Knock Out Pain® Contact Us Today! Click here to be added to our Monthly Email Tips. Are you or someone you love in pain? If so, I can help. Call me now for a personal consultation! I specialize in knocking out pain Non-Surgically using as little medication as possible. Physical Therapy is a non- operative treatment course for healing and pain reduction. Good character and perseverance always win. This is a great story that shows what makes a champion! When creating your goals for the NEW YEAR, please schedule your yearly breast and prostate exams, and a colonoscopy if it is needed. A recent update from the American Cancer Society shows the cancer death rate has been falling in the U.S. for a quarter century. However, cancer is still the second leading killer in the country behind heart disease. People often erroneously think of treatment by a pain management specialist as consisting of only opioids or commonly called narcotic ”pain killers.” However, the practice of pain medicine or pain management is diagnosis driven just like other medical specialties. Just as one goes to a cardiologist for an evaluation of heart disease and receives treatment based on a unique diagnosis, a visit to a pain management specialist results in unique treatment because every patient with pain is also different. The discipline of pain medicine is concerned with the prevention, evaluation, diagnosis, treatment, and rehabilitation of painful disorders. Dr. Bragg was honored and thrilled to be a Guest Speaker on Saturday, September 8, 2018 at PainWeek in Las Vegas. Her topic was: “Pain Management Strategies for the Geriatric Population: How to Live in Your Discomfort Zone Without Opioids”. PainWeek is the largest pain management conference is the U.S. for frontline practitioners. Increase sleep about 30 minutes more tonight than you did last night. Stress levels are affected by sleep. Studies show that 90% of people do not get enough sleep. When we do not get enough sleep, we tend to be stressed and sometimes moody. Most people only sleep about 6 to 7 hours. However, we really need 7 to 8 hours of sleep. Try to add an extra 30 minutes of sleep each night. If there is trouble sleeping, try putting on some calm music and lowering the lights. This may help clear the mind of thoughts. Those are STRONG words. Please remember, only 5% of people with back pain should have surgery. Yet more than 600,000 back surgeries are done in the United States each year. Make sure you first try non-surgical options like my clinics provide to treat your back. Surgery has no guarantees. Listen to excerpts from Dr. Bragg’s seminars and media interviews on back pain and other acute conditions. Dr. Winifred Bragg has treated thousands of patients with back pain over the past 20 years. She has written this book to educate people about the symptoms and causes of low back pain and to offer her proven strategies for pain relief. Dr. Bragg frequently speaks to Case Managers and companies throughout Hampton Roads on the benefits of thinking first about non-surgical treatments before referring a client to a surgeon. She also speaks to civic organizations, churches and corporations on how to reduce back pain in the workplace. To schedule Dr. Bragg to speak to your organization, please contact her at (757) 333-3360 or info@knockoutpain.com. 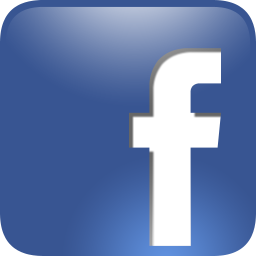 Want To Use Dr. Bragg’s Articles In Your E-Zine or Website? 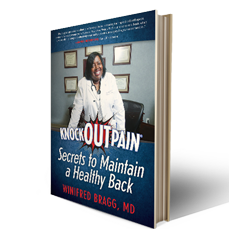 Winifred Bragg, MD, is the author of Amazon Best Seller “Knockoutpain®: Secrets to Maintain a Healthy Back” and the Creator of the Bragg Factor, a system that provides a blueprint to help you Turn Pain to Power and reach your maximum potential in your personal or professional life.